As our dependence on electricity grows, so too does the demand for skilled electrical workers. Electrical Engineering Techniques students are introduced to electrical principles and building construction wiring while technician students advance into industrial automation and PLC programming, preparing for tomorrow's trends in next generation robotics. 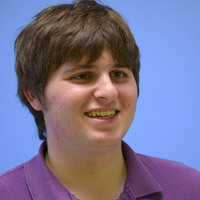 "When I finish at Loyalist I plan to study electrical engineering at university. First I want to be able to do it myself—I’ve always been interested in doing stuff with my hands. It’s exciting. We’re learning more than I ever thought there would be, and it’s a lot of fun." 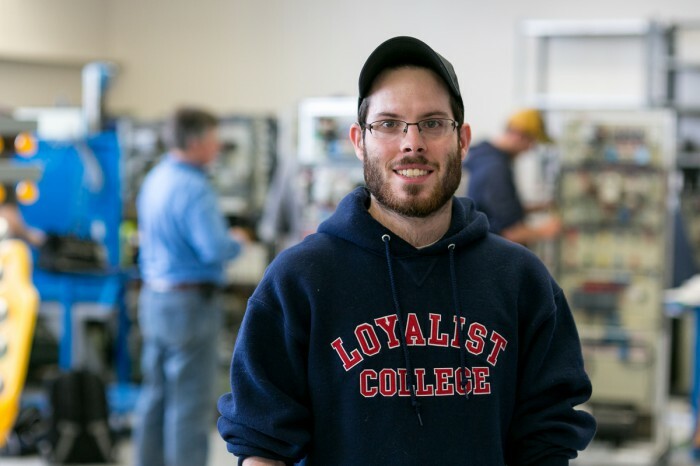 "Coming from Loyalist, I could be doing electrical work in whatever field I pick – wiring houses to running industrial motors. Electricity is the future. It’s not just wiring – it’s everything." 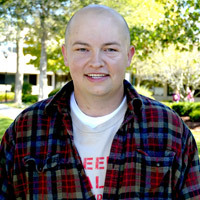 "When I started my job search in PLC programming, I used the PLC programs we completed in class in my portfolio. All the things we learned at Loyalist are exactly what’s needed for the job. I really thank you for the valuable lessons you taught us … I am on my way." "All the professors are there for you if you need them. If the door’s open you can go in, and I find even if they’re kind of busy they’ll still make time for you and put you in the right direction. They’re really helpful." Millwright/Machine Maintenance, Horizon Plastics International Inc.
Like taking things apart and knowing how they work. Enjoy hands-on learning by doing. Enjoy working with computers and new technology. 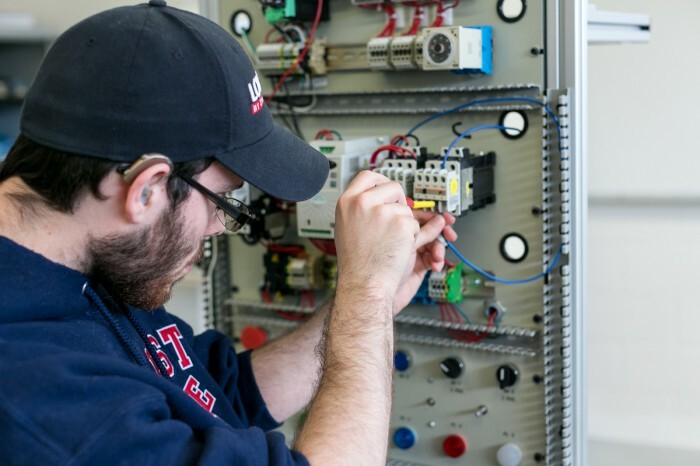 The first year provides a working understanding of electricity and electronics, as well as the fundamental skills needed in electrical construction and automation. 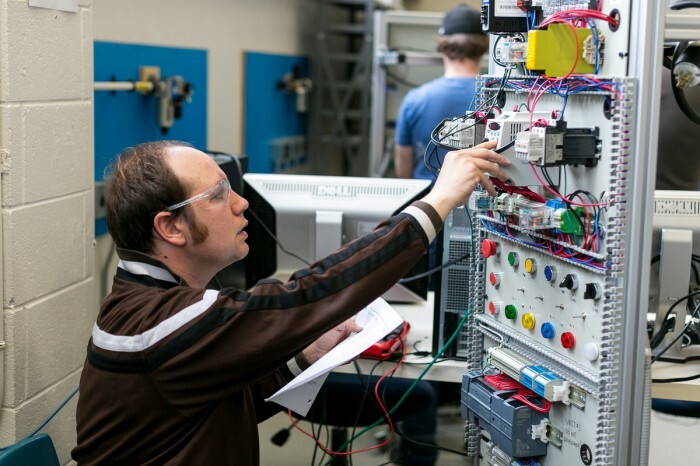 Develop skills in electrical installation, motor control and the basics of industrial processes — including Programmable Logic Controllers (PLCs), fluid power and process control. Hands-on work with actual PLCs in your first year, not just simulation software. Students gain a solid understanding of the Ontario Electrical Safety Code. 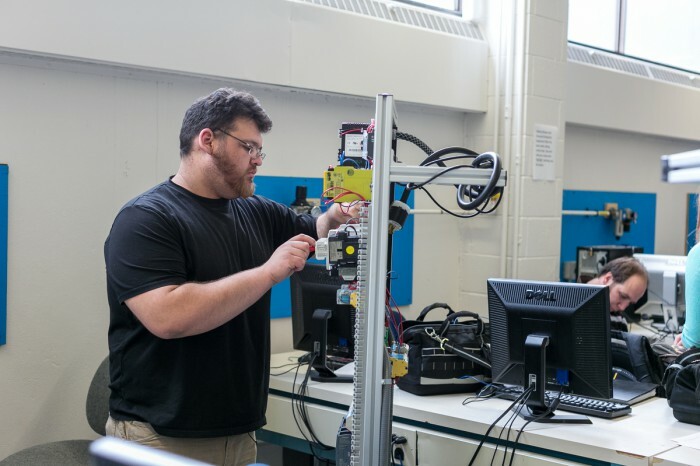 A second year of study delivers skills required in installing, configuring, maintaining and calibrating industrial control systems, including industrial robotic and automated production systems. Students can apply their knowledge to extracurricular projects, such as building a racecar simulator arcade game using only automation equipment and software. Learn with dedicated instructors who come from and still work in the industry. Professors have extensive backgrounds in manufacturing, engineering, construction, technology and telecommunications in a variety of roles such as industrial and construction electrician, lead technician, technical project manager, network engineer and corporate trainer. Students learn the fundamental electrical principals and DC series, parallel and combination resistive, capacitive and inductive circuits. Basic AC and an introduction to three-phase power are also covered, as well as the fundamental mathematical concepts used to describe basic electricity and electronics. Students learn basic installation practices relating to electrical wiring systems used in residential, commercial and industrial buildings. Students use hand tools, machinery and the actual materials used in industry. Emphasis is placed on the quality of work and safe and professional working practices. Students install electric motor control circuits using relays, contactors, starters, push buttons and other electrical control devices. This course also covers electronic and electro-mechanical sensing devices commonly used in industrial applications. This course focuses on the basics of translating diagrams to working circuits. Students learn about electrical diagrams and symbols and how to build a circuit correctly from an electrical diagram. Extra low-voltage circuits such as communications, alarm and control systems will be explored. Proper professional procedures and workmanship are emphasized. Students demonstrate the fundamental concepts of AC electricity in both single and three-phase applications, AC reactance and impedance, power factor, power factor correction and the analysis and troubleshooting of AC circuits. Magnetism, transformers, three-phase power and other topics related to AC systems are also included. 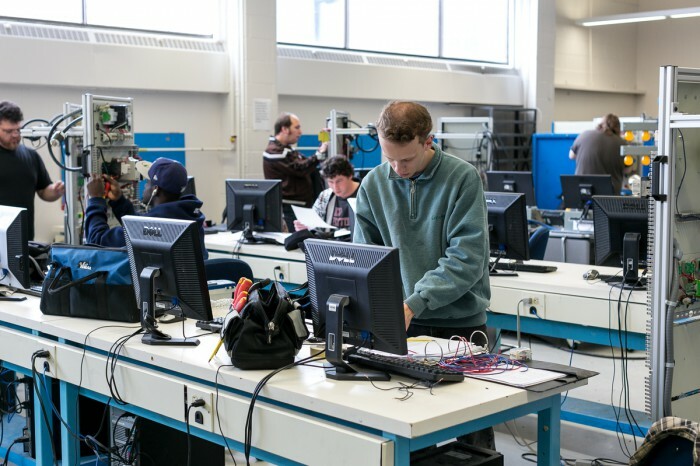 The objective of this course is for the student to be able to demonstrate the ability to use the Canadian Electrical Code, Book I to determine proper equipment, installation and maintenance requirements for Industrial electrical equipment. The student will understand and be able to apply the relevant code pertaining to industrial Control and Automation Systems. This will include the installation of fire alarm systems, emergency Stop systems, fuses, circuit breakers, as it applies to Automation Systems. This course emphasizes effective business communication. Students develop skill in written and verbal communication in a business setting, including writing messages, memos, emails, letters and reports. Verbal communication ranges from one-on-one communication to giving a business presentation. Students develop an understanding of semiconductor devices such as diodes, transistors, SCRs, TRIACs and their application. Other electronic devices used in power supplies, amplifiers motor control and other industrial control equipment are also included. This course introduces students to industrial distribution systems, from the service entrance to the end equipment being supplied. It includes such items as service entrance equipment, metering, safety switches, wireways and busways, panelboards, switchboards, circuit breakers and fuses. This course provides an overview of the programmable logic controller, PLC installation and I/O wiring procedures, general PLC programming procedures, basic PLC programming, memory basics, number systems and PLC timers, counters, arithmetic functions, number comparison function and data move functions. This course is entirely focused on the Ontario Electrical Safety Code as covered in the Ontario Electrical Safety Code book. 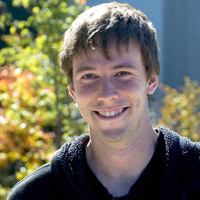 Students learn through exercises with limited time spent on lectures. The objective is for students to demonstrate the ability to use the Ontario Electrical Safety Code book to determine proper equipment, installation and maintenance requirements for electrical equipment. This course covers advanced use of the Programmable Logic Controllers and necessary instructions for advance control and communications. This course will include the Tag Based Programming used in the Control Logix Platform. It will also introduce students to Remote I/O and network control. This course is intended to provide the student an introduction to the production of electrical power by non-traditional means. Students will explore different sectors of the renewable energy field with an emphasis on wind and solar technologies used in residential and small commercial applications. A combination of lectures and labs will provide the student with the skills and knowledge needed to effectively design, install and maintain functional renewable electrical energy systems. Using AutoCAD software, the student will create basic electrical schematics, equipment layout and building construction drawings. In support of this the student will learn the basics of navigating in AutoCAD, drawing basic shapes, use of editing and productivity tools, printing and organizing of drawings. This course covers the basics of pneumatic and hydraulic systems. Common electrical and fluid symbols, drawings and devices are also covered. Emphasis will be placed on hands-on application of learning. Students learn the basic concepts of calculus using practical applications. Includes a study of statistics required to provide information for reports and documents. This course is intended to further acquaint the student with the aspects of motor control using relay logic and to introduce him or her to the fundamentals of Adjustable Speed Drives, the type used in industry today. 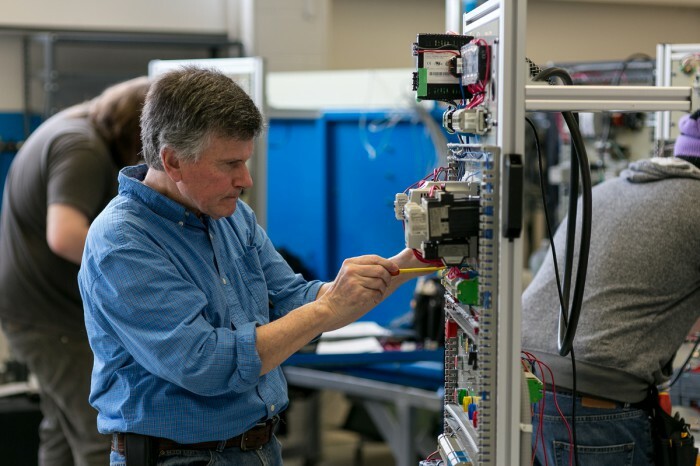 Students explore the construction, operating characteristics and connections of the alternating current type motors used in the hands-on lab experiments in the course. 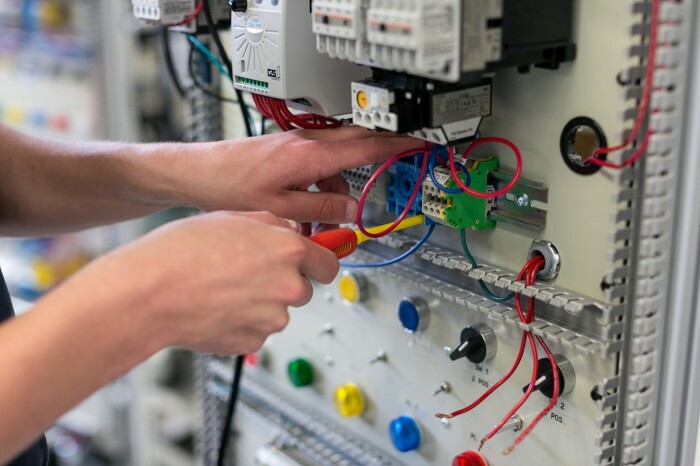 Upon completion of this course, the student will be better prepared to complete wiring tasks of electric motors and associated control circuit wiring using relay logic. Human-Machine Interfacing (HMI) technology is explored and applied in a lab setting. Students use PC based software to develop operator screens that along with programmable logic controllers (PLCs) are the brains behind todays production machinery and processes. Exploration of industrial communication methods used to interconnect automation equipment to share data and control. A variety of communication protocols will be discussed and applied to interface automation equipment. 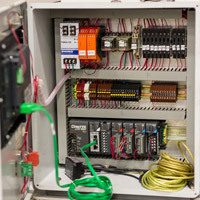 Remote I/O, HMI, PLC and VFD systems will be used as lab examples of the application of this technology. This course is intended to acquaint students with the functions of production management as it applies to maintenance. Topics covered include: the TPM system (Totally Productive Maintenance) and the basics of project management as it relates to electrical. It will cover estimating both time and materials. This course builds on knowledge from the previous semester. Students demonstrate how to interface Analog control into the Automation system as a whole. This course provides an overview of motion control concepts. 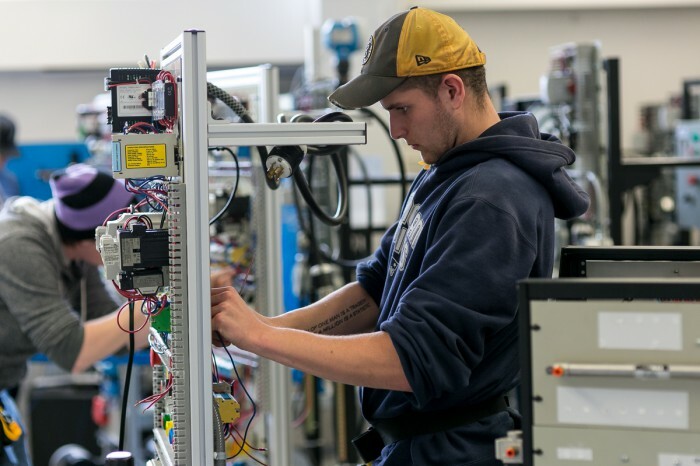 Students will be able to demonstrate the functionality and applications and programming of a variety of Variable Frequency Drives and how they are interfaced to the control system using automation networks. Students will demonstrate knowledge with Servo Systems and the functionality and application of DC motors and AC motors.